Stunning 9ct gold and diamond cluster ring. 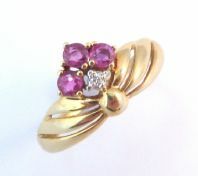 UK size T.
9ct gold, diamond and garnet cluster ring. Featuring a centrally set, faceted, oval shaped garnet, set with a diamond cluster. The ring is Hallmarked for 9ct gold, Birmingham with the makers mark BMJ. The ring is a UK Size T, US size 9 3/4. 9ct gold, diamond and garnet. Hallmarked for Birmingham 9ct gold to the inner band of the ring, with makers mark BMJ. Very good condition, very minor wear in keeping with age. Garnet medium redy-orange, well saturated with good clarity. A stunning, modern 9ct gold, diamond and garnet cluster ring. 9ct Gold Garnet Sudded Victorian Revival Style Star Burst Brooch. 9ct gold, garnet studded, Victorian revival style, star burst, layered look brooch.